Founded in 2007, DiaOcOnline is the leading online real estate network in Vietnam. With its large real estate database, wide range of customers, and strong partnerships with Vietnamese top media, DiaOcOnline covers all features in the industry: market research; offline trading-floor network; property marketing and distribution; and property management and leasing. DiaOcOnline is the only real estate website that can charge for listings, making its database the most reliable and accurate one available. 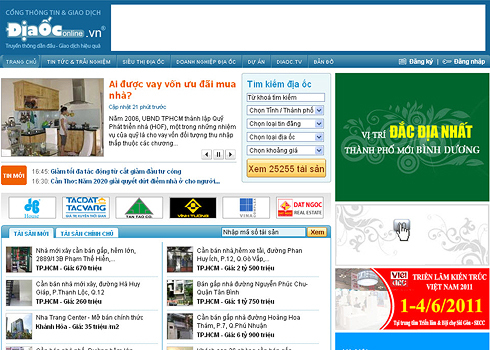 The company’s network of five sites includes DiaOcOnline; DiaOc.tv, a multimedia site; ROL.vn, the first English-language real estate site targeted at foreigners and overseas Vietnamese; Map.DiaOcOnline.vn, a searching tools site, which updating location of real estate around Vietnam in satellite; and exclusive branded site with Thanh Nien, one of Vietnam’s major newspapers. The network has 72,964 active users with 1,800 new registered members each month, more than 310,000 properties in its database and about 1,000 new listings every day.